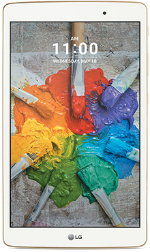 The LG G Pad X 8.0 is a tablet with an IPS LCD display size of 8 inches, 1200x1920 resolution, and 283ppi. Powering it from within is a 1.5GHz Octa-Core Qualcomm Snapdragon 617 processor with 2GB of RAM. The tablet comes with an onboard storage of 16GB with memory expansion of up to 256GB through a microSD card. Thanks to its 5MP rear-facing camera, the G Pad X 8.0 is able to capture photos and record 1080p HD videos. The front is home to a 5MP camera sensor. Included in the device is a non-removable 4,650 mAh Li-Ion battery that gives power to the device. Upon availability, the LG G Pad X 8.0 runs on Android 6.0 Marshmallow OS.